KPIs for IT should not be limited by “uptime” only! If we want to keep IT accountable and to have early warning signals about potential problems, we need to have a well-defined and balanced set of indicators. In this article we discuss some examples of IT KPIs that will be a good base for your own scorecard. Before we begin: sometime IT unit lives its own life in the company; meaning that the front-end is evaluated using very subjective metrics, while the measurement of the back-end is limited to the tracking of uptime; the rest of the indicators are too technical and/or have nothing to do with helping a company to execute its strategy. Learning – maintaining IT systems; improve by learning from the past mistakes. IT expense as a percentage of total expense, %. Running internal business systems or maintaining a website is neither your core competency, nor something that generates sales for you; this idea should be reflected in your expenses structure – pay enough to keep systems running smoothly, but don’t chase around for cutting-edge technologies. IT expense per employee, $/employee. On the one hand you need to equip your team with appropriate tools, on the other hand you need to know where to stop. Compare your data with benchmarks in your industry to make some conclusions. Support expense per user, $/user. Similar to the previous one. Having high support expenses (compared to the industry average or your own historical data) might indicate a potential problem. For example, your employees might contact IT too often because there are no clear manuals or people simply were not trained to use informational systems. Using these and similar financial indicators make sure that you understand why you are measuring them, if there is no clear understanding then just stop spending resources on tracking something that is not important for you right now. Learn more about financial perspective of the Balanced Scorecard. It is a good idea to divide performance indicators into the respective groups. IT KPIs online - sign-up with a free account for immediate access to 16 scorecard templates. 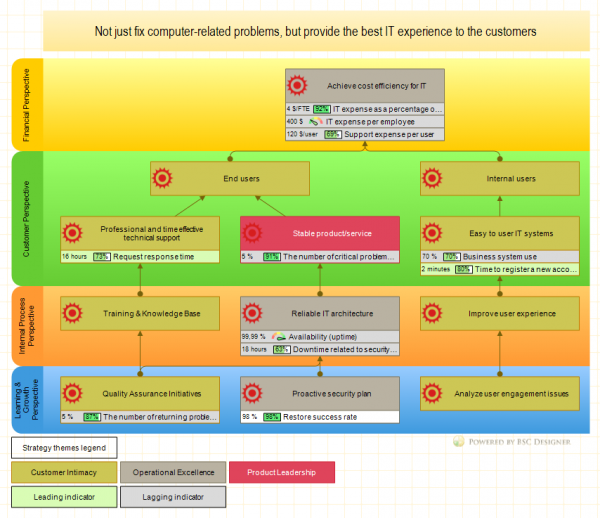 Another point is that today IT is not just about fixing computer-related problems, it’s about providing the best experience to the customers; make sure you are tracking respective experience/engagement metrics as well. Request response time, hours. This will work as a leading indicator for the business goals related to the user/employee engagement. The faster an IT team responds to the support queries, the higher the engagement rate that is expected. Business system use, %. Take some business system in your company (CRM, ERP, or BI dashboard), define an interval (for example 7 days) and calculate the percentage of registered users who used the system within the defined time interval. Compared to the historical data, this is a good lagging indicator for user engagement as well: if there is a top-notch computer software, but no one actually uses it, then it’s time to start asking questions. The number of critical problems reported by user. Problems appear every day, but it is important to learn what critical problems were found and prevented by your internal team, and what critical problems were reported by the end users (=affected your brand as a result). Answer simple questions - build a professional strategy map in 6 minutes. Strategy formulation and description might be a time-consuming project even for an experienced strategist. 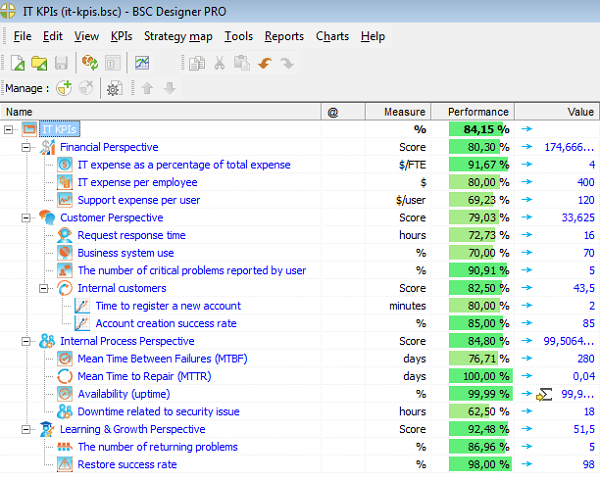 This Strategy Scorecard Wizard will make the whole process fast and intuitive. Learn more! Account creation success rate, %. Learn more about Customer perspective in the Balanced Scorecard. Normally, there are no problems with defining indicators for internal business processes. A good practice is to track separately downtime related to the security issues, and create prevention plan respectively. Mean Time Between Failures (MTBF). Average time between failures. Mean Time to Repair (MTTR). Compare this indicator to the industrial benchmark. For example, if your service provider takes too much time to repair, then find someone who will do a better job. Availability (uptime) calculated as MTBF/(MTBF + MTTR). Applied to your internal systems, network, website, etc. Downtime related to security issue. A lagging indicator for the IT security initiatives. For the leading actions one might plan regular security audits by experts. From the management point of view we need to understand if IT is on the find-and-fix-problems rail or it is learning from its errors. Here are two indicators that are a good starting point for this. The number of returning problems (simplified version: percentage of tickets reopened). Is a good lagging indicator of your improvement efforts: if your team did well first them, then less repeat problems will appear. Restore success rate. Emulate system crash, track the % of data restored and restoration time. Such emulation will generate an action plan for IT system improvement. Learn more about working with Learning and Growth perspective of the Balanced Scorecard. We have discussed some important indicators for IT. They will work for your business better if you will align them with organization’s strategy and respective business goals. This is an excellent way to revise your KPIs once again and focus on ones that need to be measured regularly. Do you have some question about KPIs or have some interesting findings? Feel free to share your thoughts in the comments. 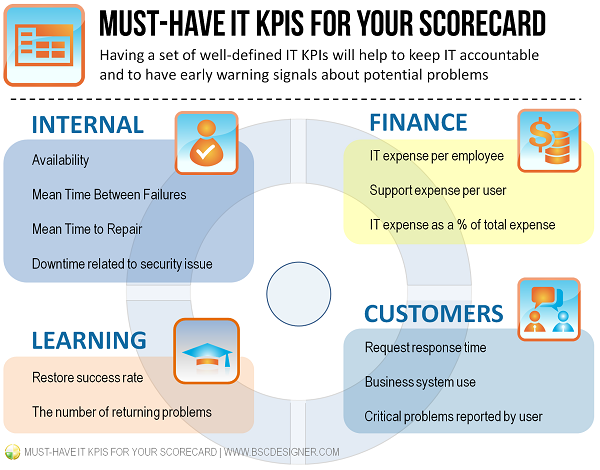 IT KPIs discussed in this article as a starting template for your own scorecard! Sign-up with a free account for immediate access to 16 scorecard templates.